There is excitement in the air! 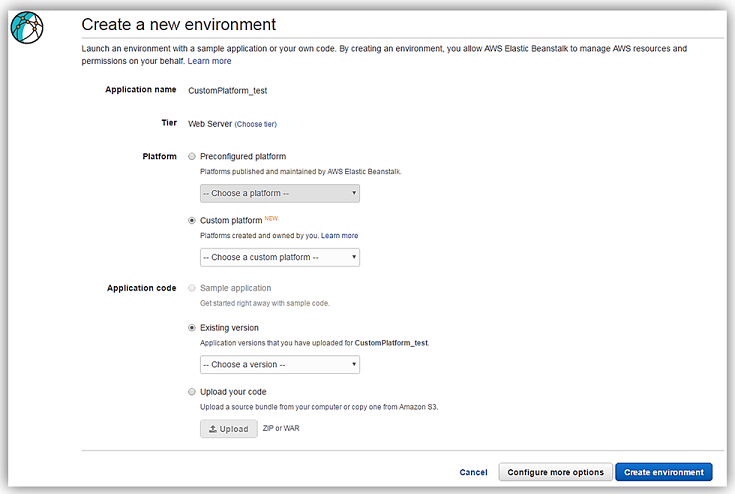 I am thrilled to announce that customers can now create custom platforms in AWS Elastic Beanstalk. With this latest release of the AWS Elastic Beanstalk service, developers and systems admins can now create and manage their own custom Elastic Beanstalk platform images allowing complete control over the instance configuration. As you know, AWS Elastic Beanstalk is a service for deploying and scaling web applications and services on common web platforms. With the service, you upload your code and it automatically handles the deployment, capacity provisioning, load balancing, and auto-scaling. Previously, AWS Elastic Beanstalk provided a set of pre-configured platforms of multiple configurations using various programming languages, Docker containers, and/or web containers of each aforementioned type. Elastic Beanstalk would take the selected configuration and provision the software stack and resources needed to run the targeted application on one or more Amazon EC2 instances. 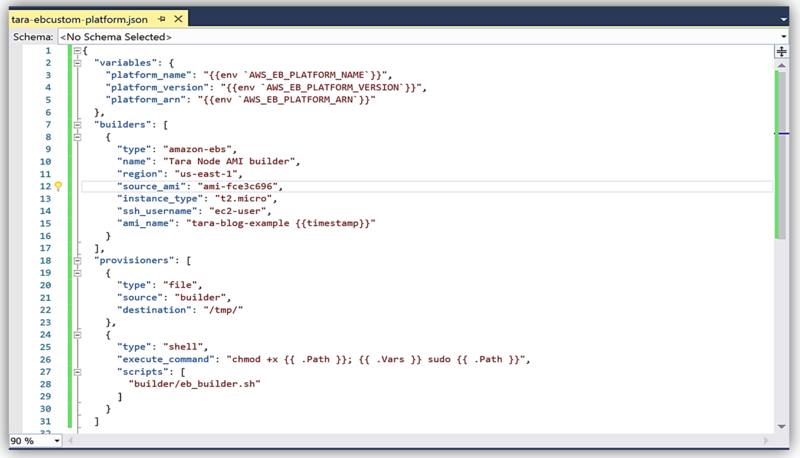 With this latest release, there is now a choice to create a platform from your own customized Amazon Machine Image (AMI). The custom image can be built from one of the supported operating systems of Ubuntu, RHEL, or Amazon Linux. In order to simplify the creation of these specialized Elastic Beanstalk platforms, machine images are now created using the Packer tool. Packer is an open source tool that runs on all major operating systems, used for creating machine and container images for multiple platforms from a single configuration. Custom platforms allow you to manage and enforce standardization and best practices across your Elastic Beanstalk environments. For example, you can now create your own platforms on Ubuntu or Red Hat Enterprise and customize your instances with languages/frameworks currently not supported by Elastic Beanstalk e.g. Rust, Sinatra etc. The best way to take a deeper look into the new custom platform feature of Elastic Beanstalk is to put the feature to the test and try to build a custom AMI and platform using Packer. To start the journey, I am going to build a custom Packer template. I go to the Packer site, and download the Packer tool and ensured that the binary is in my environment path. Now let’s build the template. The Packer template is the configuration file in JSON format, used to define the image we want to build. I will open up Visual Studio and use this as the IDE to create a new JSON file to build my Packer template. min_packer_version (optional): string of minimum Packer version that is required to parse the template. If you want a great example of the Packer template that can be used to create a custom image used for a custom Elastic Beanstalk platform, the Elastic Beanstalk documentation has samples of valid Packer templates for your review. 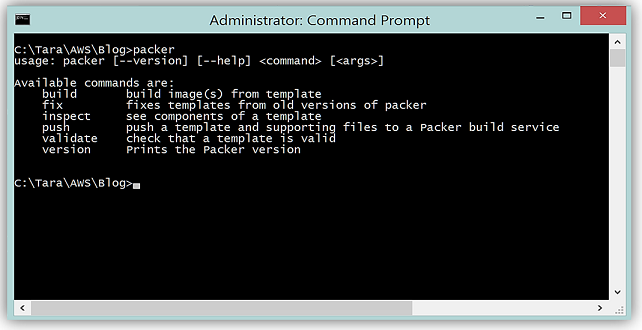 Now that I have my template built, I will validate the template with Packer on the command line. What is cool is that my Packer template fails because, in the template, I specify a script, eb_builder.sh, that is located in a builder folder. However, I have not created the builder folder nor shell script noted in my Packer template. A little, confused that I am happy that my file failed? I believe that this is great news because I can catch errors in my template and/or missing files needed to build my machine image before uploading it to the Elastic Beanstalk service. Now I will fix these errors by building the folder and file for the builder script. 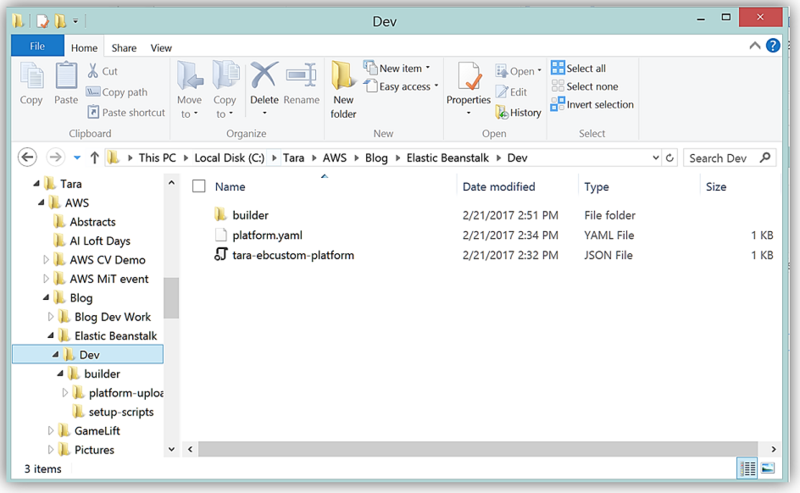 Using the sample of the scripts provided in the Elastic Beanstalk documentation, I build my Dev folder with the structure noted above. 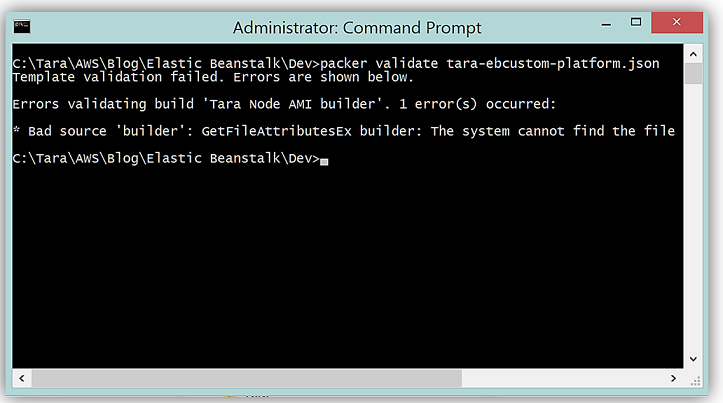 Within the context of Elastic Beanstalk custom platform creation, the aforementioned scripts are platform hooks. Platform Hooks are run during lifecycle events and in response to management operations. All of these items; Packer template, platform.yaml, builder script, platform hooks, setup, config files and platform scripts make up the platform definition contained in my builder folder you see below. Now, I will validate my Packer template again on the command line. All that is left for me is to create the platform using the EB CLI. This functionality is available with EB CLI version 3.10.0 or later. 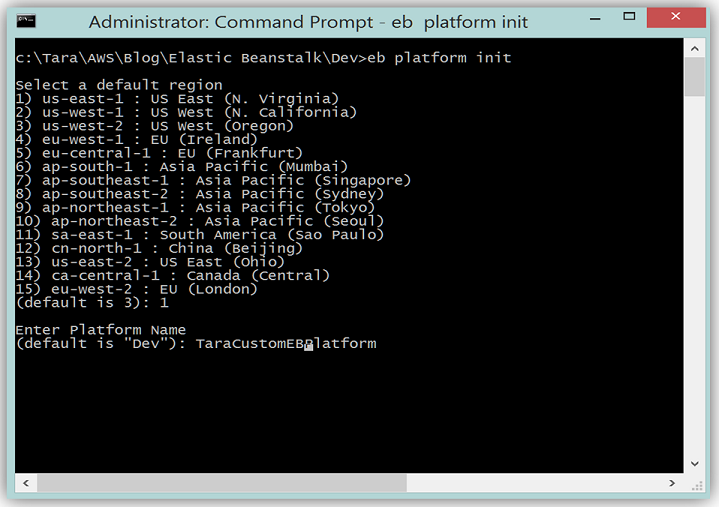 You can install the EB CLI from here and follow the instructions for installation in the Elastic Beanstalk developer guide. Validate an IAM role was successfully created for the instance. This instance profile role will be automatically created via the EB create process. I will now go to the Command Line and use EB CLI command to initialize the platform by running the eb platform init command. Next step is to create the custom platform using the EB CLI, so I’ll run the shortened command, ebp create, in my platform folder. Success! A custom Elastic Beanstalk platform has been created and we can deploy this platform for our web solution. It is important to remember that when you create a custom platform, you launch a single instance environment without an EIP that runs Packer, and additionally you can reuse this environment for multiple platforms, as well as, multiple versions of each platform. Additionally, custom platforms are region-specific, therefore, you must create your platforms separately in each region if you use Elastic Beanstalk in multiple regions. With the custom platform now created, you can deploy an application either via the AWS CLI or via the AWS Elastic Beanstalk Console. 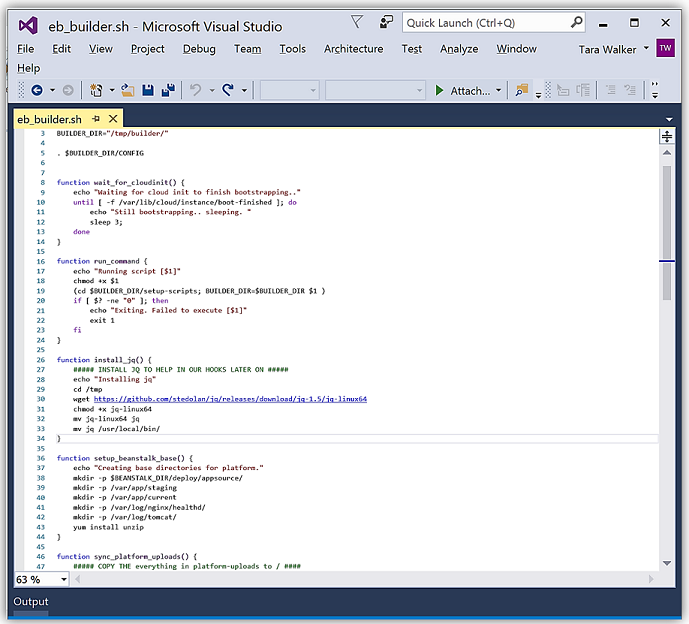 The ability to create an environment with an already created custom platform is only available for the new environment wizard. You can select an already created custom platform on the Create a new environment web page by selecting the Custom Platform radio option under Platform. You would then select the custom platform you previously created from the list of available custom platforms. You can get started building your own custom platforms for Elastic Beanstalk today. To learn more about Elastic Beanstalk or custom platforms by going the AWS Elastic Beanstalk product page or the Elastic Beanstalk developer guide.